After yesterday’s day off the market was choppy through the morning before selling kicked in - particularly in the banks today. Westpac in particular was sold off hard as UBS heavily reduced their target price and outlook for the bank – more on this later. Healthcare got a boost with the proposed acquisition of Healthscope, while energy did it’s best to offset the poor performance in financials. 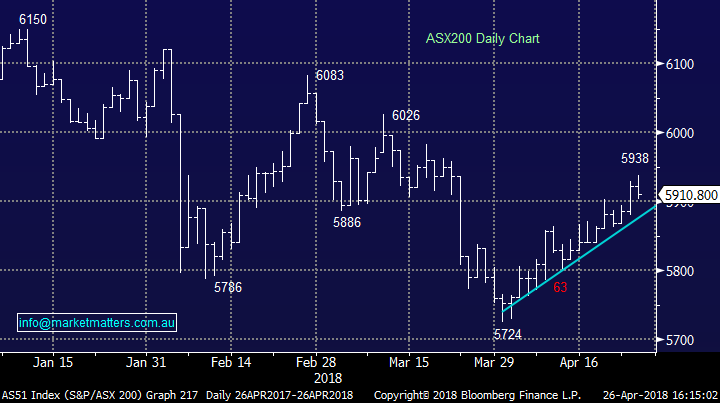 Overall the market fell 10pts or -0.18% to 5910 – not a bad effort considering the banks took 29points off the market, Westpac alone falling 11.5 index points! 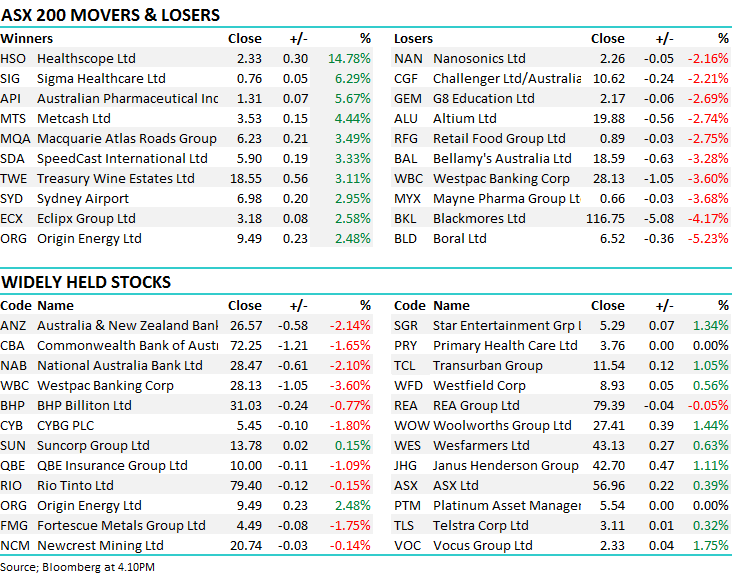 Broker Moves; Westpac was the stand out move today, with UBS heavily impacting the market. Regis Resources performed well despite the downgrade. 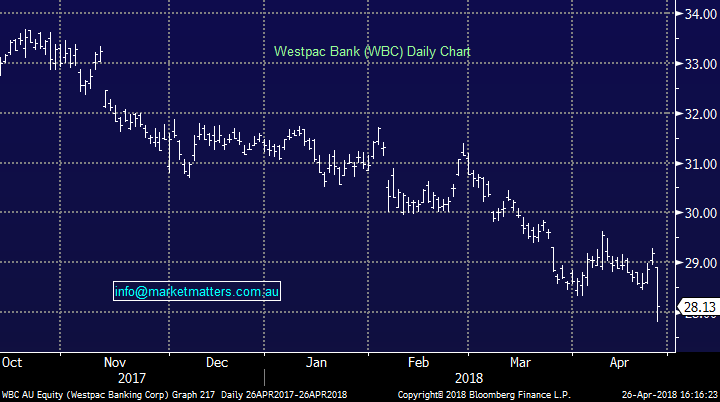 Westpac (WBC) $28.13 / -3.6%; A scathing note from UBS today clearly put the sprinklers on any optimism that was returning to the banking sector. As the Royal Commission rolls on, UBS took to pouring over the documents that had been released as part of the review including a number of internal documents and board papers. The analysts found significant shortfalls in lending standards at the bank, in particular the standards within its $400bil mortgage book. ‘Liar Loans’ where customers financial details were misrepresented to improve their borrowing ability, along with poor background and income checks were just a few of the issues UBS found within the loan book. Realistically, this is not new news – for those that have been keeping track of the various reviews into the banks in recent times and now the commission, these problems have been noted for some time. What the report does note is the sheer scale of the issues with responsible lending practices within the banks – and how significant changes in the short term could lead to a squeeze in the availability of credit, weighing on house prices, and growth and inflation in the economy – not great for the share market either. On the flip side for the banks today, APRA will remove the 10% investor loan growth restriction on lenders as long as proper lending standards are met by 1 July. Theoretically this will drive some credit growth and may work to offset the fears raised by UBS today. Shaw & Partners analyst Brett Le Mesurier was more cautious on this announcement today, noting “it probably signals that there has been a weakening in credit growth this month. The timing of the announcement is interesting because the monthly credit growth numbers are due to be released in the next few days. They will probably indicate a further slowing in credit growth.” It seems regulators are working to drive some credit growth despite the headwinds. 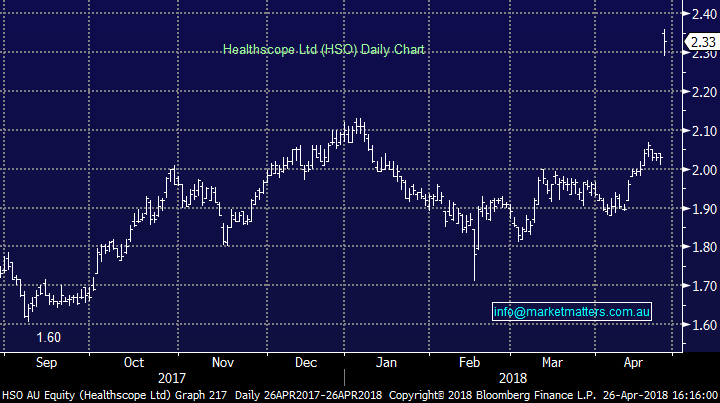 Healthscope (HSO) $2.33 / +14.78%; a consortium of investors calling themselves the BGH – AustralianSuper Consortium has launched an all-cash takeover bid at $2.36/share – a healthy but not excessive premium of 16% to Tuesday’s close. This gap has since closed to just a 1.3% premium after money followed the bid in. 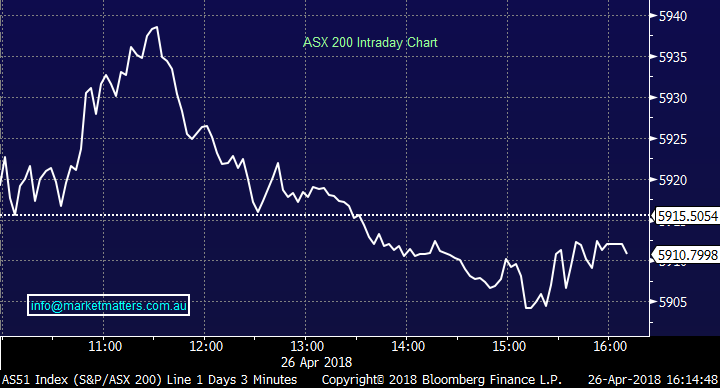 The offer for one of Australia’s largest hospital operators was led by private equity firm BGH Capital, and AustralianSuper which own 14% of the stock, along with a number of smaller players. It is still early days in the event of any takeover happening which is conditional to due-diligence, financing and unanimous board recommendations. For these reasons, this is unlikely to be the only offer for Healthscope we see and the deal will be vastly different if any takeover was to happen.